I intended to do a lengthy writeup about my wedding cupcakes when they were first produced. Anyway, I kept procrastinating til I lost my ideas (excuse of a procrastinator). It was a foam tower, wrapped with theme coloured ribbons and decorated with lacey bow and ribbon made by a friend of mine. Really love it. Apparently, the bride loves purple and she asked for everything purplish and white at the venue. 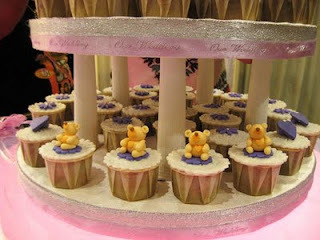 Less is more for cupcake design on wedding theme as we look at the overall picture instead of individual cupcake. Hence, I use the daisy sugar flowers as the cupcake toppers, mixed with some heart shaped toppers by the sides of Lovey Bears. I added them at the last minute to bring out the preciousness of the weddding cupcakes. 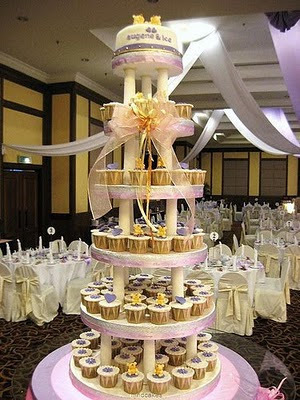 The bride was so delighted, "my guests just couldn't resist to pose in front of the cupcake tower during the photo shoot session that night." This is the comment that could make a cake designer smile in her sleep.